A grab bar is a device that is used to increase a person’s safety and independence in their bathroom. A permanently installed grab bar is different from a towel rack, bathtub soap dish, or angled corner shelf for holding bath and shower products. A grab bar is either directly installed into the studs of the walls or can be secured with specialty easy or secure mount anchors, bracing, screws, and multiple point hole flanges for greater versatility. This allows for installation with or without studs, or where stud spacing may vary from the typical 16” centers. Grab bars provide increased support, stability, and balance for the user. Grab bars are primarily used in the bathtub or shower stall but can also be installed by the toilet for support with sitting and standing. How do I know if I need a grab bar? You may need a grab bar if you’ve had falls in the bathroom, are having difficulty stepping in and out of the bathtub, if you’re having difficulty getting in or out of the tub, or on and off the toilet. People of all ages and abilities can benefit from using grab bars to increase their safety in showers and bathtubs. What can a grab bar do for me? Grab bars reduce your risk of falling in the tub or shower. They help you steady yourself while getting into and out of the tub or shower. They also assist you in safely lowering and raising yourself from a seated position. Which type of grab bar should I use? 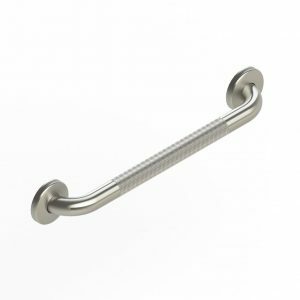 Grab bars come in a variety of styles, sizes, and finishes. For example, there are decorative, designer, easy or secure mount, peened, exposed screw, L-shaped, integrated (with towel bar, paper holder, corner shelf, side wall shelf), and other types. 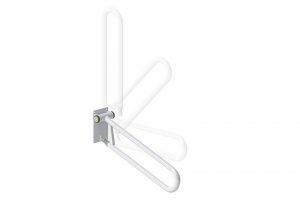 Grab bars can be positioned at different locations and angles, depending on the user’s needs. Vertical bars: These bars are mounted on the side-wall to provide support with getting into and out of the tub. The recommended length is typically between 18” to 24”. Angled bars: These bars are mounted on the back wall to provide support with getting into and out of the tub. It can also be used when getting on and off a bathing bench. An angled bar is also easier for people of different height and sizes to reach. The recommended length of an angled bar is typically 24”. Vertical and horizontal combined (L-shaped) bars: These bars are mounted against the back wall to assist in transferring in and out of the tub. It is also a good choice to assist you with getting up or down from a seated position. The recommended length of these bars are typically as follows 24” or 32” for Vertical and 16” or 32” for Horizontal. Clamp-on grab bars, also known as a tub rail, is a bar that usually fits on the wall of most standard tubs. These bars can be installed and removed for use on other tub/shower locations or for travel. However, it is not recommended to install this type of grab bar on tubs with a sliding glass door track or sloped inner walls. The tub grab bar provides added stability for individuals up to 250-300 lbs but is not designed to support full body weight. Suction cup or stick-on grab bars are grab bars that are marketed for their convenience and ease of installation (not requiring tools) for users. These bars typically come in a variety of lengths and have suction cups on both ends for suctioning on to the walls. They are not recommended due to the safety issues and dangers associated with them sliding or coming off the walls. While some of them claim to be able to offer basic support for user stability, they neither support the total individual weight of the user, nor the combined force (weight multiplied by the velocity or changes in speed and direction) that occurs during a fall from slipping or losing balance. 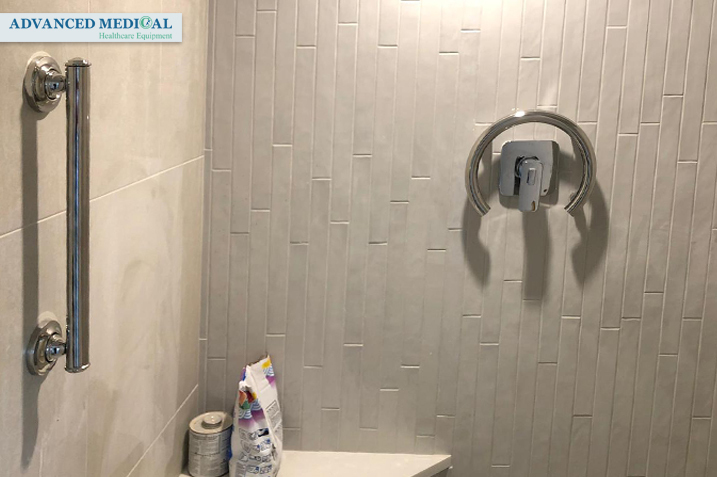 Also, the grab bar suction cups vary in quality and are known to have problems with maintaining their suctioning power on walls with water and moisture, such as those in bathrooms, bathtubs, and showers. 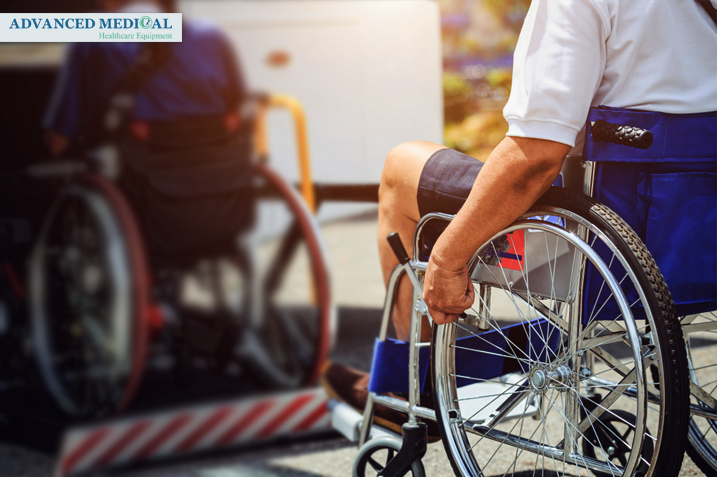 Advanced Medical Healthcare Equipment is committed to ensuring that every individual has the ability to maintain their safety and freedom in their own home without having to compromise their independence. 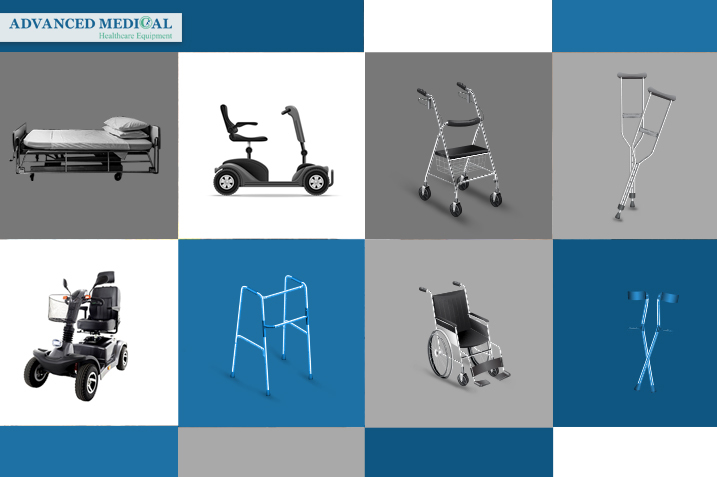 Walkers, wheelchairs, bathroom/bedroom safety products, lift chairs, compression stockings, canes and crutches, orthopedic supports, commodes, grab bars, seniors’ E-bikes, and hospital beds are examples of the equipment that Advanced Medical supplies. If you are interested in exploring what Advanced Medical Healthcare Equipment can do specifically for you, please call at 604-912-0106, or drop by at 1863 Marine Dr. West Vancouver.